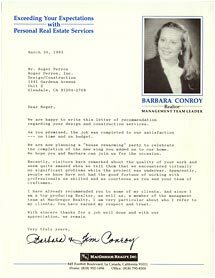 Conroy, MacGregor Realty, Inc. » Roger Perron Inc.
We are happy to write this letter of recommendation regarding your design and construction services. As you promised, the job was completed to our satisfaction–on time and on budget. We are now planning a “house rewarming” party to celebrate the completion of the new wing you added on to our home. We hope you and Barbara can join us for the occasion. Recently, visitors have remarked about the quality of your work and seem quite amazed when we tell them that we encountered virtually no significant problems while the project was underway. Apparently, people we know have not had the good fortune of working with professionals as skilled and as courteous as you and your team of craftsmen. I have already recommended you to some of my clients. And since I am a top producing realtor, as well as a member of the management team at MacGregor Realty, I am very particular about who I refer to my clients. You have earned my respect and trust.